Former White House Press Secretary Sean Spicer says he now regrets claiming that President Trump had attracted "the largest audience to ever witness the inauguration" in January. "Of course I do, absolutely," Mr. Spicer told the New York Times on Monday. Spicer made the comments after he made a surprise appearance at Sunday night's Emmy Awards in which he poked fun at his claim. "This will be the largest audience to witness an Emmys, period — both in person and around the world," he said at the start of the awards ceremony, perched behind a mock podium. Spicer's January comments were widely derided at the time. The crowd attending Mr. Trump's inauguration, although large, was noticeably smaller than the ones that come to previous presidential swearing-ins. 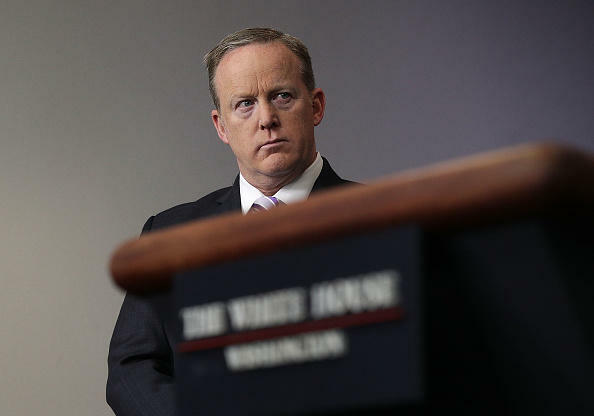 But the Saturday after the inauguration, Spicer appeared in the White House briefing room to castigate the media for what he described as a willful effort to lie about the size of Mr. Trump's crowd. "Photographs of the inaugural proceedings were intentionally framed in a way in one particular tweet to minimize the enormous support that had gathered on the National Mall," Spicer said. "This was the first time in our nation's history that floor coverings were used to protect the grass on the mall...That had the effect of highlighting any areas where people were not standing while in years past, the grass eliminated this visual," he added. Spicer said reporting to the contrary was a "shameful" attempt "to lessen the enthusiasm of the inauguration." Without providing any specific numbers, he insisted that the crowd was "the largest audience to ever witness the inauguration period both in person and around the globe." The easily debunked claim was widely mocked by both journalists and comedians. In the months that followed, Spicer's press conferences became a sensation, with millions tuning in daily to see how he would defend the president. His performances at the podium were often rocky, inspiring a series of "Saturday Night Live" sketches featuring Melissa McCarthy. He resigned from the position when Anthony Scaramucci briefly became White House communications director over the summer. Since leaving the White House, Spicer has joined Harvard's Institute of Politics as a visiting fellow and appeared on ABC's "Jimmy Kimmel Live" as a guest last week. The surprise Emmy appearance stunned many celebrities in the crowd, and was criticized by some Obama administration alums on social media.